The following is a letter by Akaya Windwood, President of the Rockwood Leadership Institute and member of the IISC Board of Directors. Kim and I planted the garden a couple of weeks ago, and this year I decided to start from seed. What a miraculous thing! When I spied the first little green shoots poking up through the soil, I stood in awe and wonderment. How could it be that a tiny dry speck, when put in the ground and watered becomes a green and living thing in a matter of days? Wow! Now, I’m somewhat of an old hand at gardening – I’ve been tilling some sort of soil for a very long time. Still, the extraordinary ordinariness of it never fails to take my breath away, even after all these years. So the corn is up, as are the beets, radishes, tomatoes, peppers, kale, lettuce and strawberries. We’re still waiting on the onions, cukes and carrots. Soon it will be time to thin, to watch for hungry bugs and birds, and generally make sure that conditions are right for everything to thrive. Here at Rockwood we’ve been planting new seeds, growing and harvesting as well. We’ve moved our offices, hired new staff, confronted unexpected challenges and instituted a new data management system. There has been a lot of fertilizing, tilling and upheaval – rather like having a rototiller come through our organization. Now we’re getting a chance to catch our breath, it’s time to tend to our collective well-being, to pay attention to the ground around us – and literally settle into our new neighborhood and culture. As I look out beyond Rockwood, I see that we are in a time of collective tumult – many leaders, organizations and movements are in states of deep shift and change. I imagine that this will continue to be the case for awhile. It’s as if the tectonic plates on which our stability depends are rearranging themselves, and we have to adjust accordingly. Even within all of this shifting, there are moments when it is best to take a breath, tend to well-being and the ground around us. I’d like to believe that Rockwood will have months of tending time, but I’ve learned that chances are we will soon enter another time of shift and change – it’s the nature of life, writ large and small. 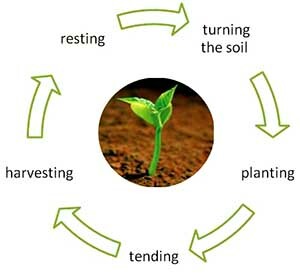 Learning from my garden, I realize that the cycle of growth and change starts by turning the soil, then smoothing the ground, planting the seeds, tending, harvesting and ends in resting. People and organizations have a similar cycle that starts with upheaval, then adjustment, response, tending, learning, and ends in integration. Then the season or situation changes and we’re back to turning the soil and upheaval once again. 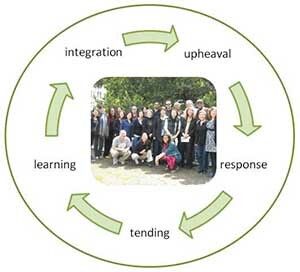 As you look into your life, personally and/or as part of an organization or social movement, take a moment and notice where you are in the cycle of upheaval, adjustment, response, tending, learning, and integration. What could best support your leadership, given where you are in your change and grow cycle(s)? What kind of tending might you need? It is important that as leaders we pay attention to the whole cycle, to rest or tend when that’s what is needed. Too often we go from upheaval to response and back without pausing, or creating space for the rest of the cycle. Our leadership is most effective when we allow ourselves time for less “active” moments (especially for the activists among us). Let’s take a breath and check in on our needs. Happy Spring! May the blessings of this season be yours in abundance. Now is the time (at least here in the northern hemisphere) for planting and tending. May whatever is in your garden blossom with great health and vitality! Thanks for this illustration Akaya! As an IISC Board member, you know that we are in a season of turning of the soil. Thanks for your leadership as we transition from our founding leaders to a new generation at the Board and staff levels. Looking forward to the tending to come! Beautiful Akaya! And perfect! Thank you!